Considering Running for a Position? Click to Browse the NSBE DC Candidate Handbook and Learn About the Roles and Responsibilities! 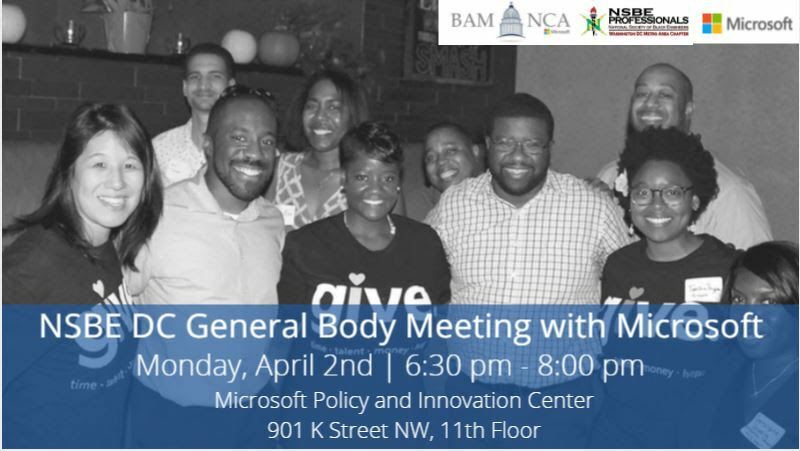 Meet us at the Microsoft Innovation and Policy Center for our April General Body Meeting! We will have remarks from BAM NCA, the African-American Affiinity Group at Microsoft. We'll update you on the chapter's current financial status. In addition, there will also be an opportunity to ask officers about their experiences in their positions before doing nominations for the FY19 Executive Board. After the meeting, feel free to network with your fellow NSBE DC members and BAM representatives and enjoy the Kinect Lounge. At 8 pm, we will all head over to the Marriott Marquis to continue networking and to watch the NCAA Men's Championship Game. Cost is free for everyone. Space is limited so RSVP ASAP! Deadline is June 2 at noon.